One of his most common drinks he'd make for us is Papaya Juice. 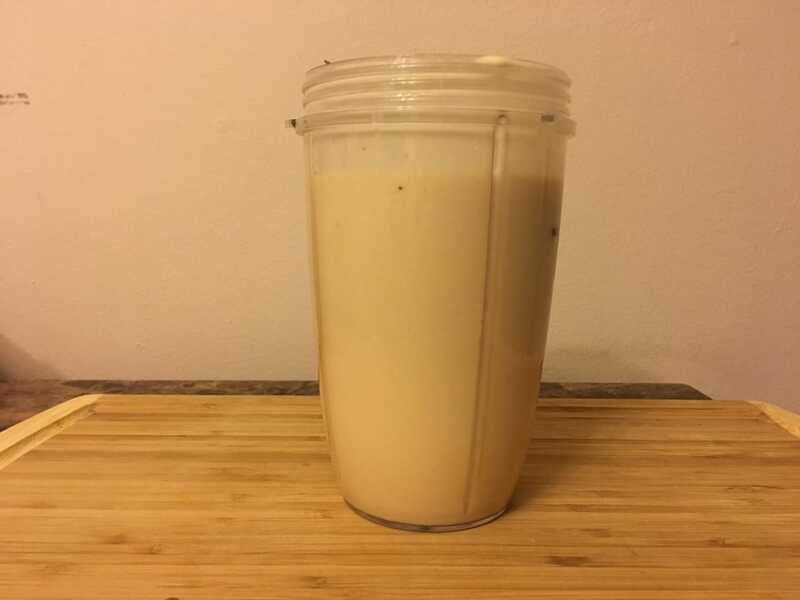 It's actually more of a shake because of the milk. We call it Papaya Juice because that's what its literally translated from Kreyol (Ju Papay). Either way, I'd like to share my take on the beverage with you and hope you give it a try. It's pretty straight forward and pretty good. 1. I personally like to use papayas that are frozen. It gives the drink a thicker consistency which I like. It also replaces having to use ice. After cutting a papaya in half, spoon out the seeds and discard. 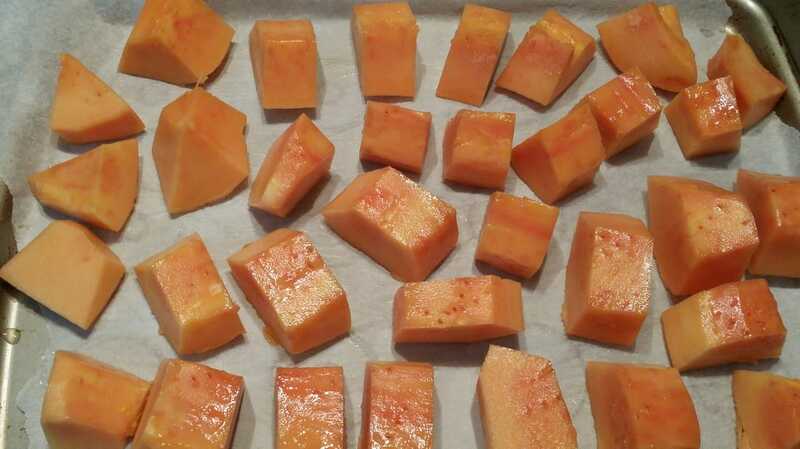 Peel the skin and cut the papaya into large chunks (1 - 2 inch pieces). 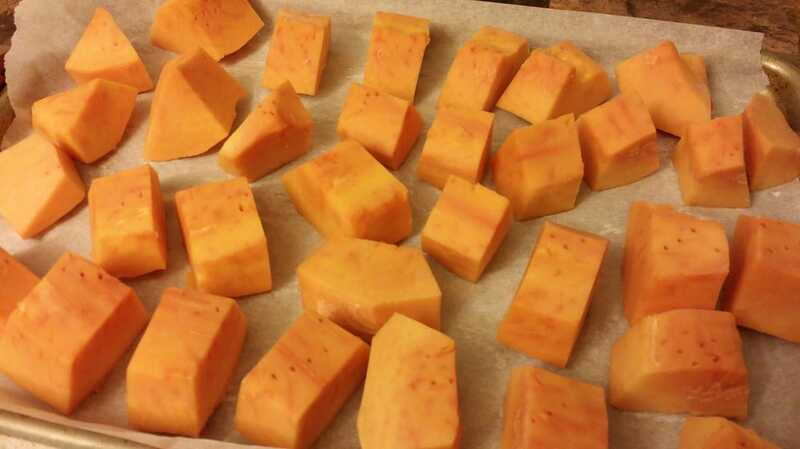 Lay on a parchment lined baking sheet and place into the freezer until frozen. 2. 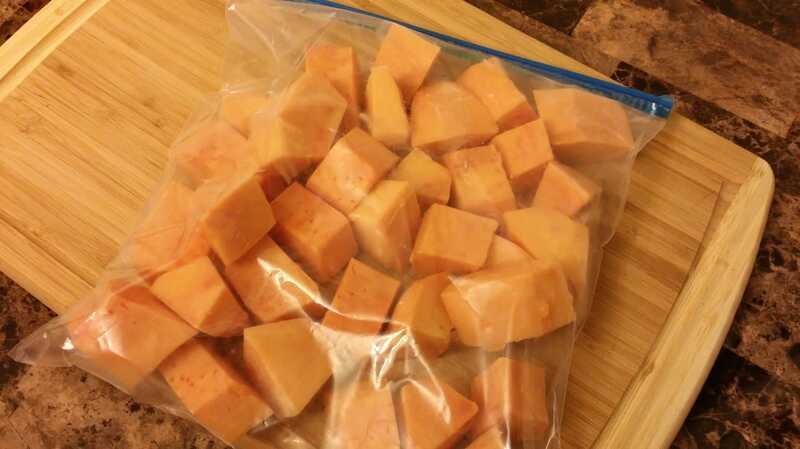 Once frozen, you can put the chunks into a large zip lock bag. I do it this way in order to avoid having a large frozen mass of papaya that's difficult to separate. Now you have papaya available on hand to use for future drinks. 3. 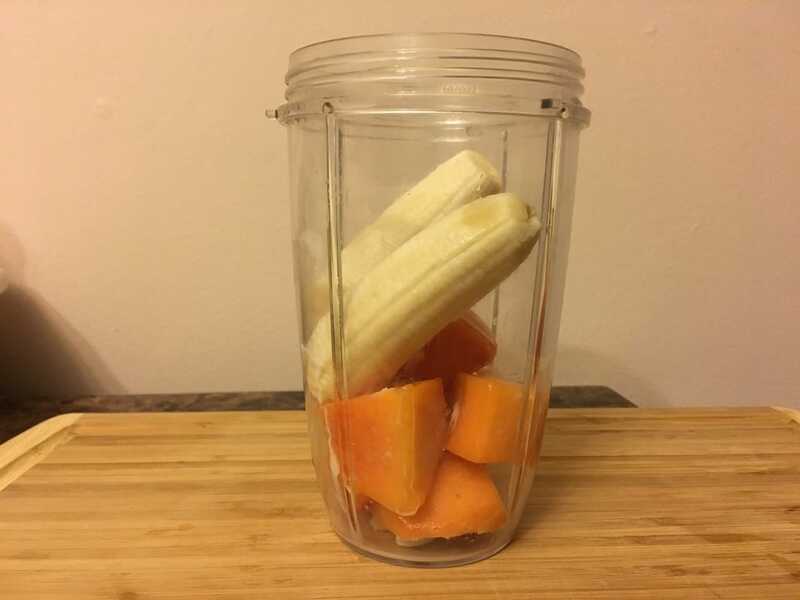 In a blender, put 1 peeled banana, approximately 1 1/2 - 2 cups of papaya, 1/4 tsp. 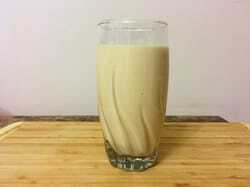 vanilla OR almond extract, 1 cup of carnation/evaporated milk, and 1/2 cup of water. Blend until it reaches a smooth consistency. If desired, you can add about 2 tbsps./or to taste of sugar or sweetened condensed milk. It may be sweet enough for some without the sugar but I like it on the sweet side and always add it in. If you're using fresh unfrozen papayas, then use about 1/2 - 1 cup of ice (depending on how creamy and thick you want it). Another option is to add a few strawberries. 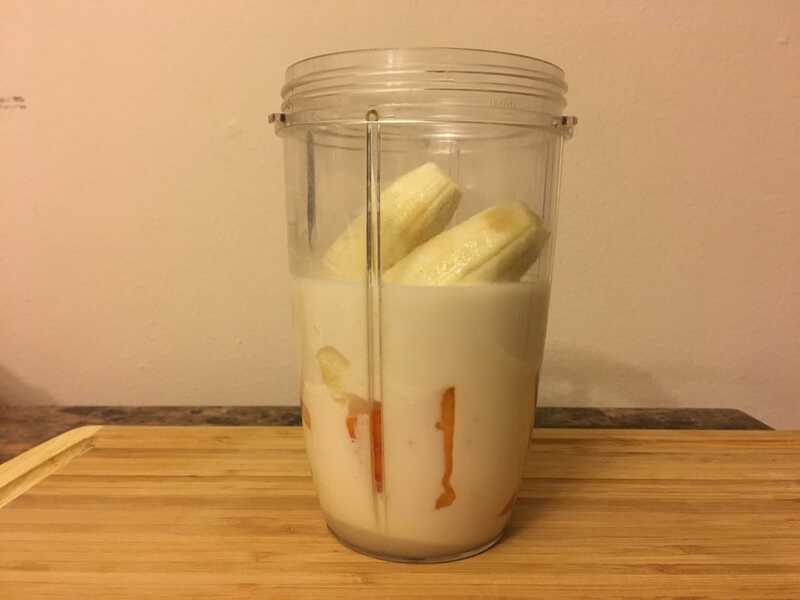 A strawberry-banana-papaya shake is a delightful combination. *UPDATE - My mother saw the original posting of my recipe and told me that I was missing a few key ingredients. She said to make sure I go back and add them in. Being the obedient child that I am (LOL), I made sure to come back and add in this little revision. A pinch of salt and a little fresh juice squeezed from a lime. For this recipe's size, approximately 1/4 to 1/2 tsp of lime juice. Why the pinch of salt? I have no idea. My mother-in-law once told me the exact same thing at a completely different time so I guess it is important. As for the lime, both my mother and grandmother explained the importance of this: After making this juice, it has to be served immediately. If you let it sit or even keep it in the fridge for a few hours, it will split. It will also turn sour quickly. The lime juice supposedly keeps that from happening. They also said it makes the drink "perfect". 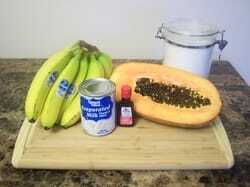 I tried it and it does taste pretty good, especially when I added more papaya. What do you think of this drink? How do you make your papaya juice?